WARNING: Terbutaline should not be used to prevent or treat early labor, since it has risks to the mother that are greater than the benefits. 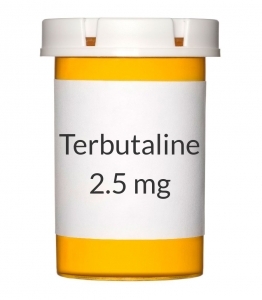 Serious (sometimes fatal) side effects have infrequently occurred in mothers taking terbutaline during labor, such as chest pain, fast/irregular heartbeats, and trouble breathing. If you are pregnant or become pregnant and are taking terbutaline for another medical condition (such as asthma), talk to your doctor or pharmacist about whether terbutaline is still right for you. USES: Terbutaline is used to treat wheezing and shortness of breath from lung problems (e.g., asthma, chronic obstructive pulmonary disease, bronchitis and emphysema). Controlling these symptoms can decrease time lost from work or school. Terbutaline is a bronchodilator (beta-2 receptor agonist) that works by opening breathing passages to make breathing easier. HOW TO USE: Take this medication by mouth with or without food, usually 3 times daily or as directed by your doctor. Dosage is based on your medical condition and response to therapy. Adults and children older than 15 should not take more than 15 milligrams daily. Children aged 12-15 should not take more than 7.5 milligrams daily. For children under 12, follow the doctor's directions for daily limits. Take this medication exactly as prescribed. Do not take more of this medication or take it more often than recommended by your doctor. If you have been directed to use this medication on a daily schedule, use it regularly at the same times each day in order to get the most benefit from it. If you take other asthma drugs by mouth or inhaling devices, ask your doctor about how to correctly take this medication with your other asthma medicines. If you notice less effect than usual from this medication, if your symptoms get worse, or if you feel you need to take any of your asthma medications more often than recommended, seek immediate medical attention. SIDE EFFECTS: Nervousness, shaking (tremor), dizziness, drowsiness or headache may occur. If any of these effects persist or worsen, notify your doctor or pharmacist promptly. Remember that your doctor has prescribed this medication because he or she has judged that the benefit to you is greater than the risk of side effects. Many people using this medication do not have serious side effects. Tell your doctor immediately if any of these unlikely but serious side effects occur: fast/pounding/irregular heartbeat, chest pain, muscle cramps, weakness. Tell your doctor immediately if this rare but very serious side effect occurs: seizures. Rarely, this medication has caused severe (rarely fatal), sudden worsening of breathing problems/asthma (paradoxical bronchospasm). If you experience sudden wheezing, seek immediate medical attention. A very serious allergic reaction to this drug is unlikely, but seek immediate medical attention if it occurs. Symptoms of a serious allergic reaction may include: rash, itching/swelling (especially of the face/tongue/throat), severe dizziness, trouble breathing. This is not a complete list of possible side effects. If you notice other effects not listed above, contact your doctor or pharmacist. See Warning Section. In the US - Call your doctor for medical advice about side effects. You may report side effects to FDA at 1-800-FDA-1088. In Canada - Call your doctor for medical advice about side effects. You may report side effects to Health Canada at 1-866-234-2345. PRECAUTIONS: Before taking terbutaline, tell your doctor or pharmacist if you are allergic to it; or to similar bronchodilators (e.g., albuterol, metaproterenol, salmeterol); or to sympathomimetic drugs (e.g., epinephrine, pseudoephedrine); or if you have any other allergies. This product may contain inactive ingredients, which can cause allergic reactions or other problems. Talk to your pharmacist for more details. Before using this medication, tell your doctor or pharmacist your medical history, especially of: heart disease (e.g., abnormal heartbeat, ischemic heart disease, high blood pressure), seizures, overactive thyroid (hyperthyroidism), diabetes, low blood potassium level (hypokalemia). This drug may make you dizzy or drowsy. Do not drive, use machinery, or do any activity that requires alertness until you are sure you can perform such activities safely. Limit alcoholic beverages. Before having surgery, tell your doctor or dentist about all the products you use (including prescription drugs, nonprescription drugs, and herbal products). The elderly may be at greater risk for the effects on the heart while using this drug. This medication should be used only when clearly needed during pregnancy. Discuss the risks and benefits with your doctor. See Warning Section. Terbutaline passes into breast milk. Consult your doctor before breast-feeding. OVERDOSE: If overdose is suspected, contact your local poison control center or emergency room immediately. US residents can call the US national poison hotline at 1-800-222-1222. Canadian residents should call their local poison control center directly. Symptoms of overdose may include: unusual dizziness, dry mouth, severe headache, seizures, very fast heartbeat, severe nausea. NOTES: Do not share this medication with others. Laboratory and/or medical tests may be performed regularly to monitor your progress or check for side effects. Consult your doctor for more details. Avoid allergens, irritants, smoking and other factors that make asthma worse. Learn to use a peak flow meter, use it daily, and promptly report worsening asthma (such as readings in the yellow/red range or increased use of quick-relief inhalers). Have your blood pressure and pulse checked regularly while taking this medication. It may be best to learn how to monitor your own blood pressure and pulse. Discuss this with your doctor.